News for 2014 from the Tristan da Cunha Government, including the Governor, the Resident Administrator, Chief Islander and Tristan-related official events in the UK and abroad. Firstly we have just had the Joint Ministerial Council back in the UK where Ian Lavarello and Chris Bates expertly championed Tristan da Cunha causes with Ministers, Officials and other OTs. While meetings in the UK may not mean much to everyone’s day to day lives here, I hope people will feel proud of the fact that Tristan was the toast of the occasion – highlighting its proactive nature, the ability to manage finances and projects by yourselves. Ensuring the island is as far as possible self-sustainable. And of course the Ministers and all the other OTs could now taste our famous lobster. We started the Water and Sewage Projects. These are major infrastructure projects that should see the island good for another 40 years, and while there have been set backs - I can’t thank people enough for their hard work, perseverance and patience in seeing them through to the end. To ensure we can protect the vital potato crops, the Agriculture department started the new fencing project to protect the Patches for years to come. I’m sure visitors may be asking whether we have ‘super cows’ that can jump over these new fences! I would like to thank the Finance Department, and all departments for monitoring and scrutinising budgets to ensure we remain in the black. For such a small island, it is vital that we have healthy reserves in case anything should happen to our key revenue stream, and I will go into more detail on that point later. But we cannot be complacent. The importance of reducing costs, is vital for the survival of the community. I am pleased to say that the RSPB have concluded their feasibility study of eradicating mice on Gough, and we remain hopefully that the project can now begin in earnest in 2018. This initiative is absolutely vital and we will need to generate support from all corners to ensure it goes ahead and protects all the critically endangered species. While I don’t want to over egg the issue - we have a huge responsibility in ensuring this project happens. The world is watching. We had great news this year that we can now sell Tristan lobster in the EU. Being able to sell Tristan lobster in the UK, France, Germany, Spain Switzerland etc is a huge coup and opens up an important market to the island. I want to thank everyone who has played a part in this process. It has taken 11 years, but after the reception it has received in the UK and elsewhere - it was worth it. The Fishing season around the outer islands has started well but Tristan is obviously a concern and we will have to monitor that carefully working in partnership with Ovenstone to agree the best way forward. But it once again highlights the fragility in our financial situation and importance of ensuring we scrutinise costs. It will be vital that we try to keep reducing costs, waste and diversify our economy. New initiatives such as the Island bakery and even the joint venture with the Isle of Man in producing Tristan Beer will hopefully help in this regard. There are other ideas for next year as well but these will be kept under wraps until we can finalise details. Following on from reducing costs - We have the renewable energy pilot in January to see whether renewable means can help to lower energy bills in the future and assist the island to become more self-sustainable. We should see further repairs to the harbour – deepening the harbour mouth, and filling in the many cavities in the harbour wall. We should also hopefully see the start on the new hospital in the latter part of the year. 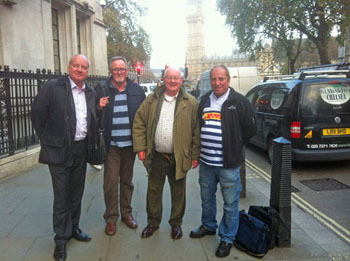 I know everyone would now like to welcome Chris Carnegy as the new UK Rep and Jim Kerr as the UK Adviser. I am also happy to announce that Chris Carnegy should be visiting us in June. Last but not least - We will need to start thinking about 2016 and the 200th anniversary celebrations. 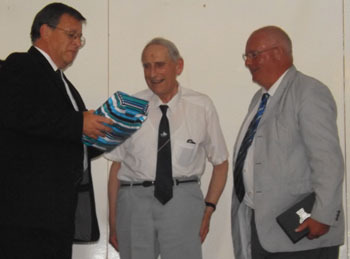 I am delighted by the news that Michael Swales has been awarded a British Empire Medal (BEM) for his services to the Community of Tristan da Cunha. 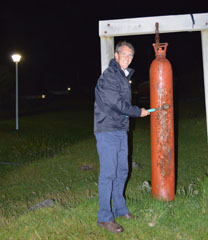 Michael has worked for over 50 years to support and preserve Tristan da Cunha, the remotest inhabited island in the world. As such the island owes Michael Swales a significant debt of gratitude. He is highly regarded throughout the community owing to his dedication and commitment to the welfare and conservation of Tristan, and surrounding islands of Nightingale, and UNESCO World Heritage sites of Inaccessible and Gough. As everyone will be aware, Michael actually carried out the most extensive scientific exploration of Inaccessible Island, performing vital conservation work and garnering numerous research papers. As part of Michael's work he has made incredible efforts to expand educational opportunities for the island children. Michael founded the Denstone scholarships, thereby giving students from Tristan an opportunity to gain a full education in the UK. This work has continued with the new Education Fund, recently funding a new crèche on the island as well as supporting two Tristanian children in higher education in South Africa. The first time this has ever been achieved. 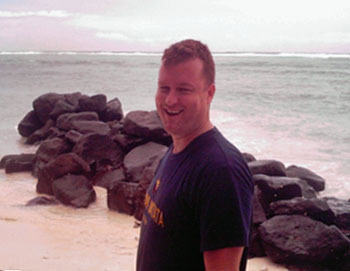 Michael was also the co-founder of the Tristan da Cunha Association, and is the current President. Due to his leadership the Association continues to go from strength to strength continually supporting the community across the globe. While many people may start to slow down in retirement, Michael has tirelessly continued to work with Her Majesty’s Government, as well as Non Governmental Agencies such as the RSPB to assist Tristan, and ensure the islands’ long time viability. Tristanians are incredibly welcoming, and he has certainly been taken to Tristan da Cunha's’ heart, winning everyone’s respect, trust and friendship. Michael may be almost 6000 miles away, but he will always be part of this community. Since my tenure as Administrator I have also benefited from Michael Swales wise counsel and friendship. His interest and support over so many decades has safeguarded the community for generations to come. Therefore I, and the whole island, want to congratulate him on this well deserved honour. I am pleased that Chris Bates has been recognised for an honour, and been bestowed a Member of the British Empire (MBE) in the New Years Honours. 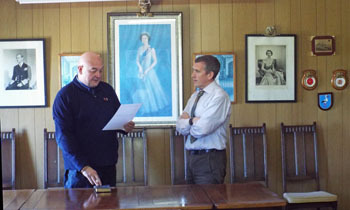 The Chief Islander, Island Council, as well as every Tristanian (and a wide raft of individuals in the Foreign and Commonwealth Office, RSPB, UKOTA, Isle of Man, St Helena, Gibraltar etc) would like to congratulate Chris on receiving this accolade in recognition of his service as the UK Representative for Tristan da Cunha. When accepting the post I doubted Chris realised that he would be jet setting around the world on behalf of the Island. However he has traveled to all points of the globe expertly raising the Islands profile. Tristan da Cunha’s voice is sometimes very hard to be heard over all the other UK Overseas Territories, but he has ensured that the Island has been promoted and defended in equal measure. Chris’s silver tongue and perfect prose have also systemically built up good working relationships with other Overseas Territories such as Gibraltar, St Helena, Falklands and Caribbean Islands, as well as Crown Dependences. Through Chris’ achievements Tristan da Cunha now has an excellent working relationship with the Isle of Man Government, implementing joint initiatives on infrastructure, tourism, marine, and agriculture programmes. These inter-island ties have only come about through Chris’ unflagging efforts to ensure Tristanians can be self sustainable for future generations. We truly are in a much stronger position than we have ever been on the UK and world stage, and it has been in no small part to Chris Bates efforts. All that is left to say is that we all congratulate Chris on this well deserved Honour in recognition of all the support he has given to Tristan over so many years. Chris will be sorely missed by the ‘Remotest Inhabited Island in the World’. The Bates legacy will hopefully live on in his successors, but Chris has ploughed a path that will be hard to follow. Once again congratulations and we all hope Chris has a successful, happy and prosperous future. A future that will hopefully see him back on Tristan da Cunha soon. is in the UK for crucial meetings. and with the two colleagues who will take over his role when Chris retires from this post in January 2015.
to represent and support Tristan overseas . with the Houses of Parliament behind. The annual Overseas Territories Joint Ministerial Council (JMC) brings together political leaders from the Overseas Territories and UK Ministers. It will be held in the first week of December. The JMC is the principle forum for reviewing and implementing the shared strategy of all the Overseas Territories for promoting the security, good governance and prosperity of the Territories and their sustainable economic and social development. Tristan da Cunha's Chief Islander Ian Lavarello and Tristan Government's UK Representative Chris Bates will be attending the event. Also see reports of the JMC and meetings leading up to the council on a separate 2014 JMC page. As part of this years process for the JMC, all Overseas Territories were asked to compile a progress grid of that particular territory's actions since the last meeting. TDC Government have provided a comprehensive overview of the steps that have been taken, including a number of projects that should assist the infrastructure for the community. This paper is available to download as a PDF: Joint Ministerial Council 2013 - Progress on Implementation of Agreed Actions and is the first such Tristan Government paper to be available to the general public in a new initiative. One of the projects relates to a renewable energy pilot to be started in 2015. Further details can be found on the Tristan Renewable Energy Project page. Following the departure of Chief Executive Officer Kobus Potgieter at the end of his contract in October, Tristan prepares to welcome two new appointments during November. First to arrive aboard MV Edinburgh will be Chris Standing who will take up the new post of Finance Officer. Chris is a 55 year old Cipfa qualified public sector accountant who has worked in a wide variety of roles mostly with the London Borough of Ealing including Education; Technical Services (equivalent to Tristan’s Public Works Department ); Planning; Policy and Social Services and as a Financial Accountant at Reigate and Banstead Borough Council helping set the budget and Council Tax level; closing the accounts and producing the financial statements as well as managing and mentoring the Cipfa trainee accountants through to qualification. He has a wide range of interests; enjoys doing cryptic crosswords and enjoyed commuting to work by mountain bike for the past 5 years sometimes getting muddy and wet. Unfortunately 2 days after Alex recruited him, his wife Joyce had a cycling accident breaking her leg after hitting a pothole. Joyce is eager to come to Tristan as soon as her leg has recovered and make sure Chris is contributing fully to Island life. 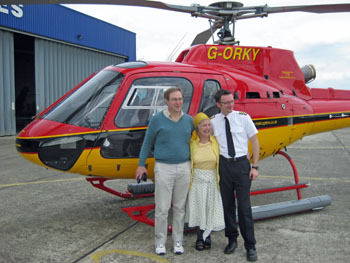 Chris celebrated his 50th birthday with a celebration helicopter flight over London and is pictured left with his wife Joyce and the pilot in front of the aircraft. 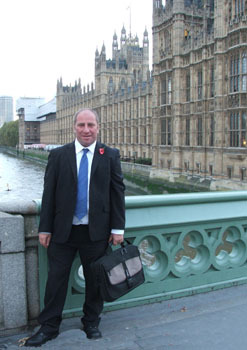 Matthew is 41 years old and has worked as a solicitor since 2006. During this time he spent over 2 years working in Micronesia on the islands of Kosrae and Chuuk as Legislative Legal Counsel and as a Legal Trainer/Assistant Attorney-General. Matthew advised the Kosrae State Legislature on national tax reform and proposed foreign investment bills, and drafted resolutions to facilitate and/or attract foreign investment, he also undertook some advisory work in Chuuk on statutory interpretation and foreign investment bills. Matthew has worked on tax and administrative law matters in Australia in addition to general litigation. Part MBA qualified, he is keen to come to Tristan where he believes his legal background and training coupled with his business qualifications and past experience may be a good all round mix. He is keen to experience the islands hospitality and to make a contribution in his role.He looks forward to meeting everyone this November. We wish both men well for their journeys and successful time on Tristan. Administrator Alex Mitham and his wife Hasene will depart Tristan aboard MV Edinburgh on or around 27th May 2014 for a period of leave and to attend business meetings in the UK. after being sworn in as Acting Administrator and being congratulated by Administrator Alex Mitham. Following the decision of the present UK Representative Chris Bates to retire from the post at the end of 2014, the Government of Tristan da Cunha (TdC) recently advertised for a new UK Representative and UK Assistant. As Administrator I am very pleased to announce that Chris Carnegy will be our new UK Representative, while Jim Kerr will become our first UK Representative Assistant. Both Chris and Jim will start in January 2015. Chris has a background in the media and a keen interest in Tristan da Cunha, including conducting live radio reports from the island in 2011. Jim Kerr is also well known to the island, first arriving in the 1980s and working off and on at St Marys School until the present day. 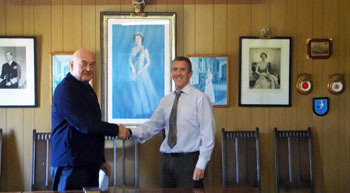 Both Chris and Jim have a passion for the Overseas Territories, and especially in supporting and promoting Tristan da Cunha’s interests around the world. The community is looking forward to working with them in the future. “I am delighted that Chris Carnegy and Jim Kerr have been selected, and I warmly congratulate both on their appointments, and look forward to meeting them in due course. Their valuable skills and knowledge of the Island make both Chris and Jim well placed to represent Tristan da Cunha’s interests in the UK and further afield. These are unique roles for a unique island and I wish them every success in the coming years. I would also like to take this opportunity to thank Chris Bates, who I had the pleasure of meeting on the RMS St Helena in November 2013. Chris has been an incredible Ambassador for Tristan over the past 6 years and I know how much the island has benefited from his support. I wish him all the best for the future”. as he issues a challenge sure to be taken up! It will be vital that we can centralise procurement in 2014, reducing cost and waste and diversify our economy even further to ensure the future for the island. If we stumble, no one will be there to pick us up. Times are hard everywhere and if we do not succeed on our terms we will be left with few alternatives. We have the water project starting in January - As well two harbour projects – the repair of the south wall as well as further dolosse work. We have improvements in the slaughterhouses, supermarket, roads and new storage and maintenance shed and we will continue to push for a decision on the harbour. We should also hopefully see the start on the new hospital. I know everyone is sceptical and I don’t blame you, but I am hopeful we will finally gain approval from DfID to move ahead. I know people are concerned about people retiring at the school and hospital. They have spent decades supporting the community, and we should rightly recognise their selfless dedication when the time comes. While we will do everything we can to get resources from overseas - we have to look inwards to find people willing to take on these posts. We should have Tristanian teachers for Tristanian children, Tristanian nurses looking after Tristanians. I know this will be a challenge, but I am confident we can overcome it. To end on a positive note - the Island Council recognised that we do not have a national holiday that specifically celebrates Tristan's heritage and culture. So I am pleased to announce that the Council have agreed that a new national holiday called Longboat Day will be instated next year and the traditional longboats race brought back. We all thought it’s vitally important the island does not lose that heritage. This year the long boats were painted up and look great - next year they’ll be in the sea! I appreciate this will take time and effort but we think it’s worth it for the community’s sake – so I hope everyone looks forward to it. And to add even more incentive, I’ll be in one of the long boats – so you’re going to have to beat the Admin – otherwise you will never live it down!